Skip Bennett was raised in the Island Creek neighborhood of Duxbury in a family that has been a fixture here since the town’s founding in 1637. The son of a lobsterman, Skip spent years working on our Bay digging mussels, razor clams, and steamers. After college in the early 1990’s He bought some of new england’s earliest clam seed from a hatchery on Cape Cod and decided to try his hand at growing quahogs—he was hooked. After all of his clams died, he moved onto oysters. For eight years skip was the only person growing shellfish in Duxbury Bay or anywhere near it. He funded nearly a decade of trial and error out on the tide through the wild harvest of mussels and razor clams, and horseshoe crabs.. He devoted himself to a salt washed life with barely enough money to pay the bills, but he was his own boss and Duxbury bay was his playground. Eventually he was joined by Christian Horne from an oyster-farming family in Maine; by Don Merry, a longtime friend and owner of a local fish market; and by his father, Bill Bennett. By 2000 the group finally began harvesting enough oysters to give it a go on a full-time basis. 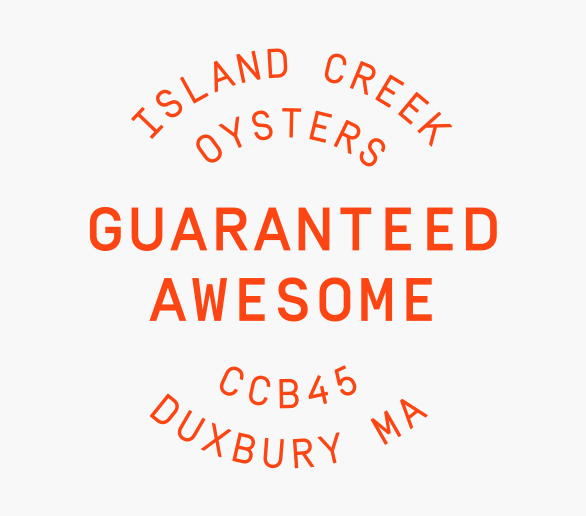 The ensuing years confirmed what Skip seemed to know all along, that the cold, turbulent, salty waters of Duxbury Bay produced an oyster that chefs the world over would come to revere. Today Island Creek Oysters can be found as the house oyster at Thomas Keller’s sister restaurants The French Laundry in Napa Valley and Per Se in New York City. They have been revered by food critics such as Sam Sifton and R.W. Apple. They have even been served at state dinners at the White House. We are a vertically integrated farm dedicated to making an impact on our food systems and having a damn good time along the way. We operate one of the only shellfish hatcheries in the northeast; a distribution company selling shellfish from over 100 farms to about 700 chefs around the country; a retail business serving thousands of home-shuckers online and at our shops in Duxbury and Portland, Maine; a restaurant group in the Boston area; and an international development NGO active in Haiti, Africa, and right here in Duxbury. No matter how busy we get, the farm is at the heart of everything we do here at Island Creek. A Muddy, windswept flat in Duxbury Bay is where it all started and where it will remain. Here in our backyard we grow food- the kind that’s good for the people who eat it, for the people who grow it, and for the place where it is raised. We hope you love eating our oysters as much as we love growing them.